in the syntheses of a variety of potent semisynthetic antibiotics, mainly 1-N-acylated derivatives, by several different research groups [23,28-31]. As known in the general oligosaccharide syntheses [32,33], 1,2-trans glycosylation is more convenient than 1,2-cis glycosylation, and it can be achieved by neighboring group participation of the acyl group protected hydroxyl or amino group at the C2 position of the glycosyl donor. Formation of a cyclic intermediate between the C1 and C2 atoms of the glycosyl donor in the presence of promoters prevents the a-face attack and leaves the 5 face open for the approach of the glycosyl acceptor. In a recent synthesis of neomycin analogs , the glycosyl donor 21, having the O-^-nitrobenzoyl group at position 2, was employed. In this synthesis, the neamine derivative 20 was used as the glycosyl acceptor to couple with 21 in the presence of borane trifluoride etherate as the promoter, to afford the key intermediate glycoside 22 (compounds 20-22 ). A similar strategy was also applied in several other examples of aminoglycoside synthesis [35-37]. Compared to 1,2-trans glycosylation, it is more difficult to construct 1,2-cis-glyco-sidic linkage in high selectivity and yield. However, this is what is needed in the syntheses of the majority of aminoglycoside antibiotics. A solution to this problem is found in the popular strategy of the use of glycosyl donors with nonparticipating protective groups as the substituent for the functionality at the position 2. 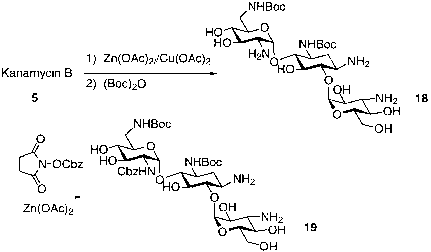 This strategy gives 1,2-cis glycosides selectively due to the anomeric effect. For the amino sugars with the amino group at position 2, four glycosyl donors with various substituents at this position have been developed. The first strategy uses a Schiff base as the amino protective group in glycosylation reaction. Umezawa and colleagues  have successfully accomplished the total synthesis of paromamine, neamine, neomycin C, streptomycin, dihydrostreptomycin, and lividomycin B by the use of 4-methoxybenzylimino as the 2-amino substituent. 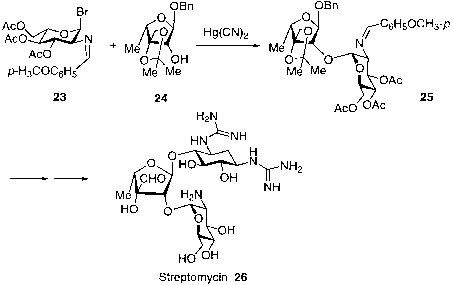 For example, in total synthesis of streptomycin 26, the l-acetylbromoglucosamine derivative 23 was coupled with the acceptor alcohol 24 to afford the a-l-glycopyraniside 25 [38,39] (compounds 23-26). Alternatively, employment of the glycosyl donors bearing the 2,4-dinitrophen-ylamino substituent at position 2 in the presence of insoluble promoters such as AgOTf and AgClO4, led to the formation of the glycosidic linkage in favor of the 1,2-cis anomer in moderate yields. 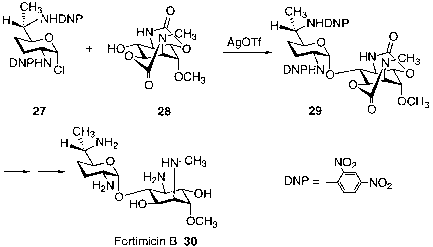 Thus, in total syntheses of fortimicin B (30) and ribostamycin, glycosylation of the glycosyl chloride 27 with the aminoinositol derivative 28 gave the corresponding a-glycoside 29  (compounds 27-30 ). The final useful method for the 1,2-cis glycosylation reaction involves an addition-elimination-reduction sequence, developed by Lemieux in the 1970s . This strategy was successfully employed in the syntheses of streptomycin and gentamicins. For example, the addition of nitrosyl chloride to the acetylated glucal 35 resulted in the formation of the dimer adduct 36, which underwent reaction with the acceptor alcohol 37 to yield a-oximino glycoside intermediate 38. 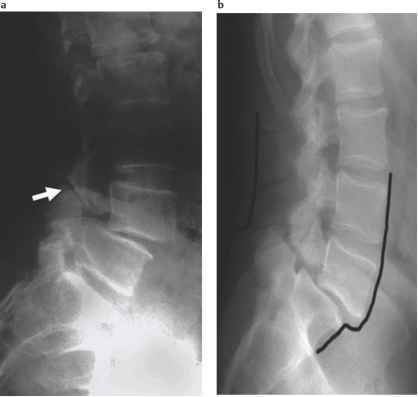 Compound 38 was subsequently reduced by hydrogenation and deprotection to afford gentamicin X2 (39)  (compounds 35-39 ). In the case of amino sugars with the hydroxyl group at position 2, the use of the benzyl group as the hydroxyl protective group leads to stereoselective formation of 1,2-c(>glycoside. Thus, the 2-O-benzyl-protected glycosyl bromide 40 was coupled with the alcohol derivative 41 to produce conveniently the a-glycosidic product 42 in 44% yield  (compounds 40^2 ).